Fax Software and Fax Modems for Windows 10/8/7. Easy to use fax software and network fax server software for your home office or business. 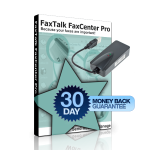 FaxTalk® fax software for Microsoft Windows® It works with your traditional telephone, cable telephone or VoIP telephone service using a fax modem. FaxTalk software can replace your fax machine, internet fax service and basic or discontinued fax software like WinFax PRO®. No fax service subscription or internet connection is required. No fax service fees. No additional page fees and no storage fees. Truly unlimited faxing. FaxTalk is not an internet fax service, so there are no monthly internet fax fees. You never pay per page. No document storage fees. No wasted toner, ink or paper. Save all your incoming faxes in PDF format. Print only the faxes you need and discard junk faxes. Send or receive unlimited faxes. 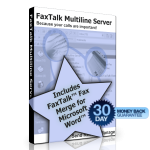 Support for up to 8 fax lines using FaxTalk Multiline Server. Support for V.34 (Super G3) High Speed faxing, Color Faxing, Photo-Quality images. Add the FaxTalk Fax Merge Add-in for Microsoft Word for personalized fax broadcasting. 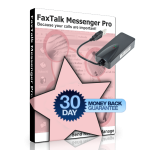 FaxTalk is compatible with 64 bit and 32 bit Microsoft Windows desktop and server operating systems. Support for Microsoft Windows 10, Microsoft Windows 8.1, Microsoft Windows 8, Microsoft Windows 7, Microsoft Windows Vista, and Microsoft Windows XP (SP3). Server operating systems include Microsoft Windows 2012, Microsoft Windows 2008 and Microsoft Windows 2003. FaxTalk Fax Merge Add-in for Microsoft Word requires a 32-bit version of Microsoft Word.